“If something is Pliable it means it can be easily bent around– like play-dough,” my mom went on. And I can see her getting the play-dough out and twisting it around, although I’m not sure she actually did. She explained how Pliable was easily convinced to follow Christian and then easily persuaded to turn back when they met danger. Growing up, I don’t remember regular read-aloud times, but my Mom shared with us the stories she loved and gave us a glimpse into a fascinating new world. And when I learned to read, a process I don’t even remember, I was eager to explore this world of stories. I remember devouring a certain red set of books full of adventures, mystery, and poetry (whose rhythm captivated me). I can still quote sections of Casey at the Bat, The Highway Man, and the Cremation of Sam McGee from reading and re-reading them. And that brings me to the first and maybe most important motivation to make reading aloud a regular part of your home. Reading aloud is an advertisement to your child to the wonders contained in books. Reading aloud to your child long before he is capable of reading gives him the idea that reading is pleasurable. It gives him a desire to also learn to read so he can explore this magical world for himself. If your child’s first exposure to reading is learning his sounds in kindergarten, or “the cat sat” after those sounds are painfully mastered, don’t blame him if he doesn’t want anything to do with reading. 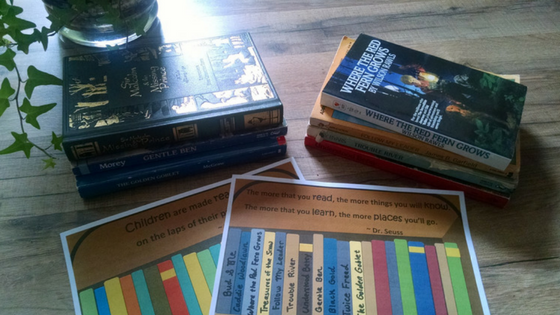 But if instead, your child already knows the wonders contained in books, he will be motivated to solve the “code” and dive into the magical world of reading. Reading aloud draws a family together. When we ask our boys what some of their best memories are, they often bring up reading aloud together. In this age, when electronic devices are so prevalent, reading together as a family encourages everyone to “unplug” and spend time together without the distractions of screens. I love the fact that reading aloud can be done almost anywhere making it a great family activity. We’ve read aloud in our living room, in the bedroom all piled on my bed (when the kids were all smaller), in hotel rooms, in the car, and even under the stars of our flat-roof house in West Africa when we didn’t have electricity and the house was too hot to stand another minute. Reading aloud causes children to associate comfort, security, and love with books. Even children who are too young to understand the words are able to associate books with the warmth and safety of a parent’s lap. My two-year-old has been slow to actually sit still while I read an entire book, but she’s getting there. In the meantime, we’ve been talking about the pictures found in her books, playing “Can you find ____?”, and taking advantage of books with textures or flaps. She loves to bring me stacks of books, so I know that a love of reading is growing in her long before she is able to read. And lately she’s starting to actually sit still while I read the book through. So don’t give up if you have a squirmy child, but tailor your reading time to her attention span. Reading aloud gives your child an advantage when it comes to learning to read. Studies show that children who are read aloud to have a huge advantage when it comes to learning how to read. One of the reasons is that reading aloud expands your child’s vocabulary so that when he is reading on his own, the words he meets are familiar. I was reading a book to my daughter today and marveling at the depth of vocabulary contained in a simple picture book (silhouetted, tawny, preoccupied). I don’t remember if I knew the words pliable and obstinate before I encountered the characters in the pages of Pilgrim’s Progress, but I knew them after that. When I encountered those same words later in other books, they weren’t strangers but familiar friends. Reading aloud lets you equip your child with the resources needed to face difficult situations in the future. Reading aloud gives your children heroes to look up to. There are, of course, the Biblical heroes found in the pages of scripture. David, who with only a slingshot and his faith in God, faced the giant alone. Daniel, who even when his life was threatened, stood firm in his resolve to do what was right. Then there are the many biographies of famous men and women–Gladys Alward who was so determined to go to China as a missionary that she would let nothing stop her, Jim Elliot (and others with him) who gave his all to bring the gospel to a remote jungle tribe, Harriet Tubman who risked her life, again and again, to help her people to freedom, and many, many others. So in this coming year, I hope you make reading aloud one of your family traditions. To keep track of the books we read aloud I’ve created a printable book log. I find it motivating to have a place to record the books we’ve read. There are four different color schemes and two different quotes. Just print the one (or ones you want). You can grab a PDF of the Printable Reading Logs here. I have read to my children all their lives, and even when they have started high school, we have tackled longer books, just enjoying them together on a quiet afternoon. My youngest son and I read the entire Ring Trilogy out loud together. I miss those days because they get busier and busier, and even homeschooled kids end up being away from home more the older they get. Enjoy these days because they will become precious memories. Yes! I realize these days are going to pass by. Even though, right now we have a two-year-old so we get to start all over. It’s been fun to be back in the stage of picture books with her and I’m looking forward to our favorite read-alouds again. I’m sorry! I always loved when the children would beg for one more chapter and promise to rub my back if I did. 🙂 Maybe she would enjoy doing something while you read. Sometimes it can be hard to have our children grow up, but I’ve learned that each stage has its unique joys (along with its challenges).